CURRENT SPACE: The owner of this property came to me a little overwhelmed to say the least! They had bought a 1970s two story house (sight unseen) which was very run down. I think they were worried about what I would think of their one step away from derelict new home, truth was, I couldn’t wait to get my hands on it! CLIENT BRIEF: The owner was looking for a modern, open planned family home. They needed the space to flow better, and to create a warmer feel, with a larger communal kitchen for their growing family. 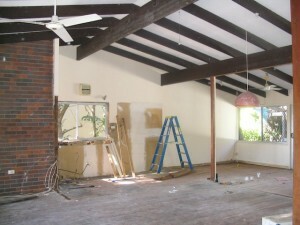 COMPLETED SPACE: We polished the floorboards, and as expected, the result was faultless. We opted to remove all of the partition walls to create one large space, and moved the laundry around the corner along a breezeway to the pool. This made picking up wet towels and bathers a synch after a day of swimming. A more intimate space was created by lowering the ceiling height in the kitchen area, and leaving the feel of larger, more lofted zones in the dining and lounge. The lowered ceiling also allowed for great lighting, desperately needed in the kitchen. While the owners’ budget didn’t allow for the use of expensive materials, we kept within their means by using white laminate, and making it appear more expensive with smaller timber panels. This saving meant that they could splash out on stone benches. 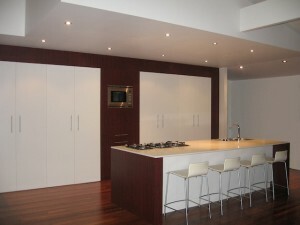 In the end we created a 7 metre kitchen, with the ample storage that the owner had been dreaming of. The large scale kitchen bench would seat all family members for breakfast, as well as communal cooking at dinner time, with easy access to the pool area.